If people are satisfied with the free version and want to purchase the paid version, they have to uninstall the free version first and then purchase and install the paid version. If they don’t, they might run into errors (depending on your application and to what extent you messed up your code). You have two separate applications with split download counts in your Developer Console, even though they’re in fact the same application. You have to take measures for your development environment to be able to build two different versions of your application with little effort. For quite a lot of people, that can be a bit cumbersome. To tackle these two problems mentioned above, you can also put all your functionality in a single app, and create a paid app that will serve as a ‘key’ to your app and sign them with the same certificate. Then, you can easily check if the user has installed that paid ‘key’ app if he wants to use a feature that needs to be enabled for paying users only. Let’s take a look at the following code snippet. Basically, what this function does is checking whether the paid ‘key’ app is installed. If so, it returns true. If not, it returns false. It’s crucial that you do the check in line 18. If you don’t, then anyone can just create a randomly signed package with the same name as your ‘key’ app after which your app would incorrectly think that the user paid for the ‘key’ app. If you don’t do anything extra, your users will end up with two icons in their app drawer. Obviously, this is undesirable. However, it’s solved easily by removing a section from your AndroidManifest.xml. Whenever the Android system wants to show the app launcher, it broadcasts a specific intent to which activities can respond. Activities that respond will end up in the launcher with an icon. (This is also why some apps can have multiple entry points in a launcher.) Just remove the intent-filter from your manifest with name ‘android.intent.action.MAIN’ and category ‘android.intent.category.LAUNCHER’ to make sure that your activity won’t respond to that intent. 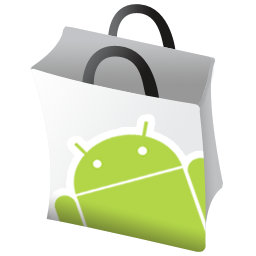 Be sure to read the post at the Android Developers Blog about the new licensing service. For now, this new licensing service will only apply to your paid app(s) and not your free app(s). That’s all! If I’m wrong about anything (remember my disclaimer at the top? :)), please leave a comment. Posted on July 31, 2010 by Franklin. This entry was posted in Android, Development and tagged market, paid app. Bookmark the permalink. However can you still use the (new) Google Licensing scheme which relies on occasionally contacting Google to check the License? Surly only the paid app ‘key’ can do this? This is exactly what I need, thank you so much. But I still have 1 doubt. What happen if user backup the ‘key’ app using some backup tools (i.e Titanium), then copy the backed up APK and install on another device? > your users will end up with two icons in their app drawer. > Obviously, this is undesirable. I don’t see that as a problem. He installed the free app… so it’s there. He installed the paid-app… so it’s there. I think it would be MORE confusing if “installed apps started disappearing on there own”…. as well as “I’m seeing apps in my install-list… that I don’t see on my laucher”. If a user doesn’t want an app… he can simply delete it himself. Does your method require the user to install the “free app first”… then later the “paid app”? What happens if he only directly installs the “paid app” alone? > Developer Console, even though they’re in fact the same application. You would *NOT* want to see the different counts between your “paid downloads” separately from your “free downloads”? Why not? VERY handy info. Thanks for posting this! It’s a really effective way to do the free/paid app split. I’ll definitely look at using this method in some of my future apps. Thanks, this was a good way to handle this, but i have a problem when i try to add this to my app. if (isProInstalled(null)) and that will throw me a NullPointerException. I guess this is something simple, but maybe you could help me with this? Because Activity is a sub-class of Context.